This is SilentMode with his first ever Reviewers Academy review. Over the next few days I will be reviewing not just one but six of the eleven sets in the new, somewhat controversial Friends theme aimed at the girls market. With the new theme comes many new parts and even new colours, and of course the new style of minifigures. But will these sets live up to expectations? Will they sell as much as LEGO hope? More importantly, are these sets any good? 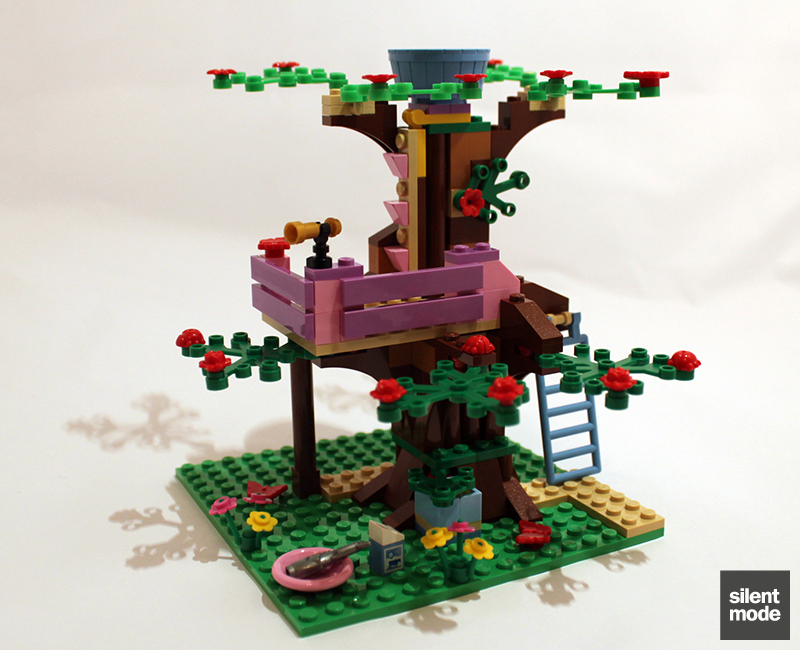 Let’s kick things off with this first review of Olivia’s Tree House: a makeshift nature observatory standing in some kind of park or open space, manned (or perhaps girled) by Olivia. This set, above all the others, was the one that stood out the most when I first saw the Friends theme on sale. I think it was because, while the other sets had an obvious feminine design, the tree house looked like it could be adapted for boys’ use with the right colour scheme. Instead I bought two other sets (3188 and 3931) first, and purchased this one only a few hours ago. 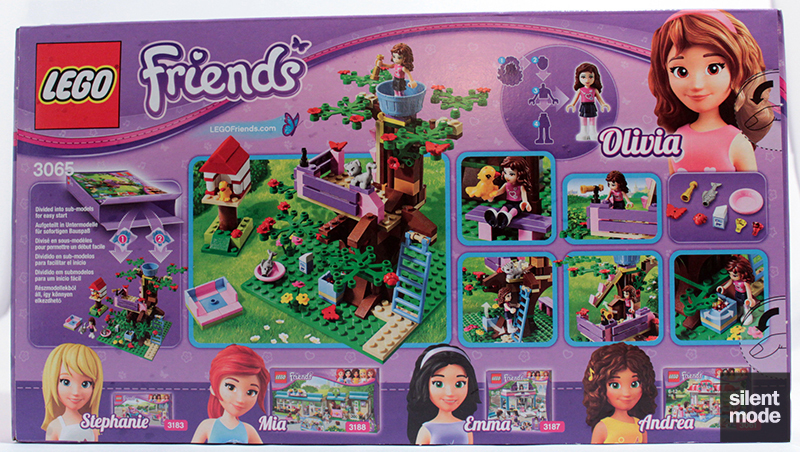 The back of the box shows the play features of the tree house, as well as the anatomy of a Friends figure, the other main Friends characters and some of the sets they feature in. A common feature among the Friends sets is that the featured character (in this case Olivia) is shown on the top right. You may notice with the larger sets that the boxes have unusual curved sides to them. 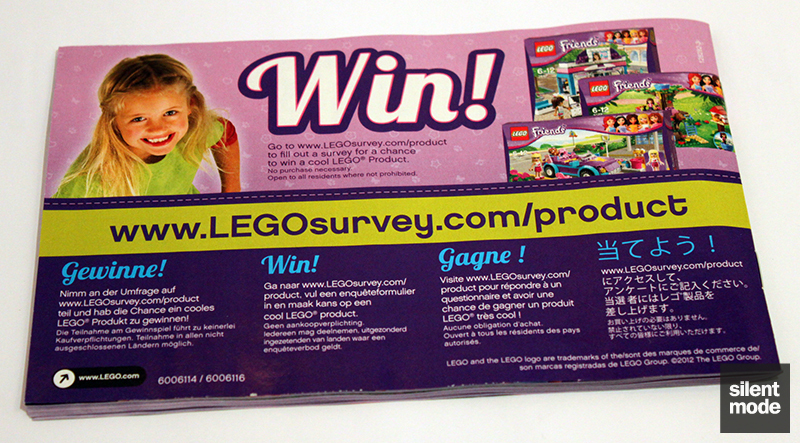 I’m wondering if this was something girls specifically asked for, or whether LEGO introduced it to distinguish these sets as being for girls. Apart from the unusual shape it gives the box, I don’t think it really adds anything – but it’s a neat trick. If you ever wanted to keep and store the box, you’ll be glad to know it folds flat. LEGO seems to be slipping back into its old ways with regards to packaging: compared to the length of the box there isn’t much inside. We’re presented with two numbered bags (which I think are too big for the contents, especially #1), a 16×16 Bright Green plate and the instructions. …No! Surprisingly or unsurprisingly Gewinne!son has been replaced with Gewinne!th, along with a radically different, Friends-themed design. The whole instruction book has the symbolic purple throughout, but is otherwise no different to any other instruction book. This first page shows how to put together one of these new figures. While we’re here, let’s show the figure parts and what they look like put together. This is all there is to a Friends figure: a hairpiece, a head, a torso and a pair of legs. Note the connection between the torso and the legs. Here’s Olivia assembled, and you might notice there’s something wrong with this figure already. No? Well the front and back of the box shows Olivia wearing a hairband, but we don’t see one here or included in the set. I can see this being an issue for some picky buyers, but there is also a picture at the front of the box – and on one of the sides – showing what the included figure looks like. You might already know that Friends hairpieces can be worn on minifigures (and probably vice versa), which I thought was a very smart move on Lego’s part. None of the other parts are interchangeable: you can’t put a Friends head on a minifigure (the hole is too small), and you can’t put a minifigure head on a Friends torso (the hole is too big). As might be obvious, you can’t rotate a Friends figure’s hands independently of the arms (Jack Stone style). 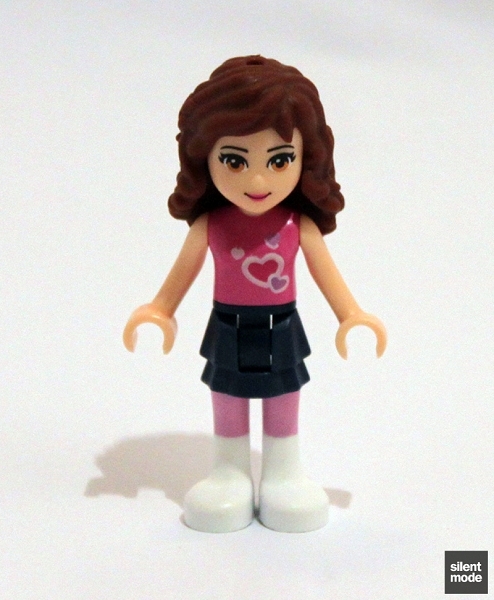 Here’s a generic female minifigure demonstrating the compatibility of a Friends hairpiece, which is made of a rubber-like material. You’ll notice a hole on the side: there are three such holes in the hairpiece – one on each side and on top – for attaching hair accessories. If you wanted to you could use minifigure hairpieces with a Friends figure. Some combinations will work better than others, and you’re free to try just about anything to find the right look. 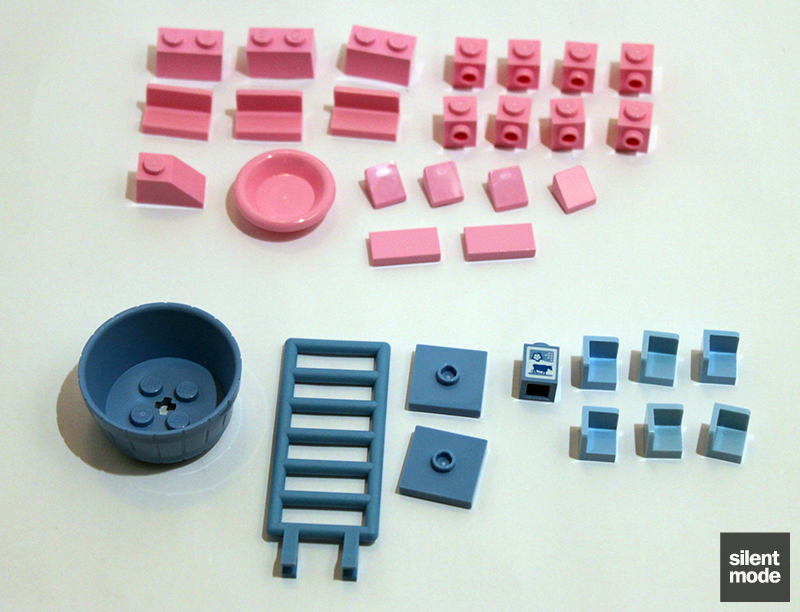 This particular set showcases two new colours for 2012, as shown with these parts. The blue is what BrickLink is calling Bright Light Blue: very slightly lighter than Medium Blue, and the same colour as the S6 Sleepyhead’s clothes. 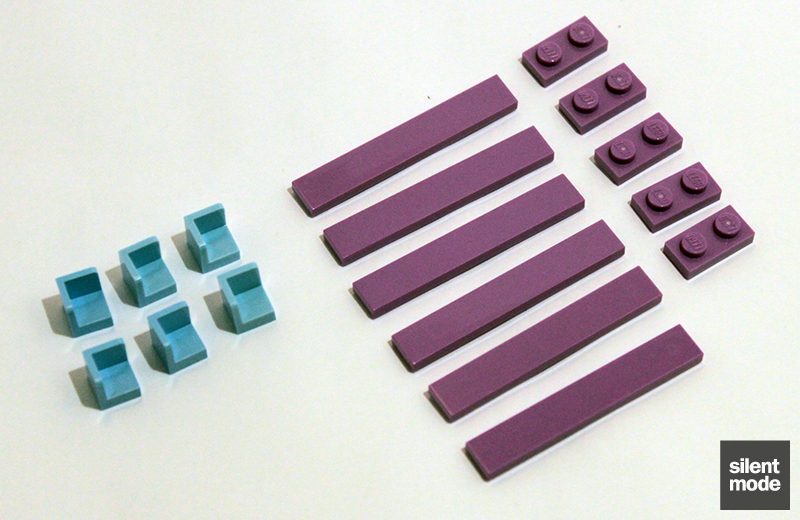 The purple is what BrickLink is calling Medium Lavender. 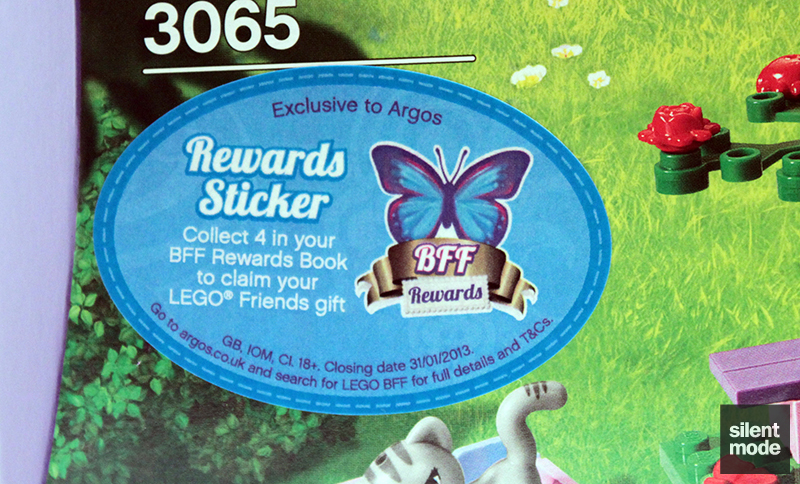 I’m particularly happy about these colours because I remember wanting to see pastel colours in LEGO. I can’t wait to see what else shows up in that purple colour. 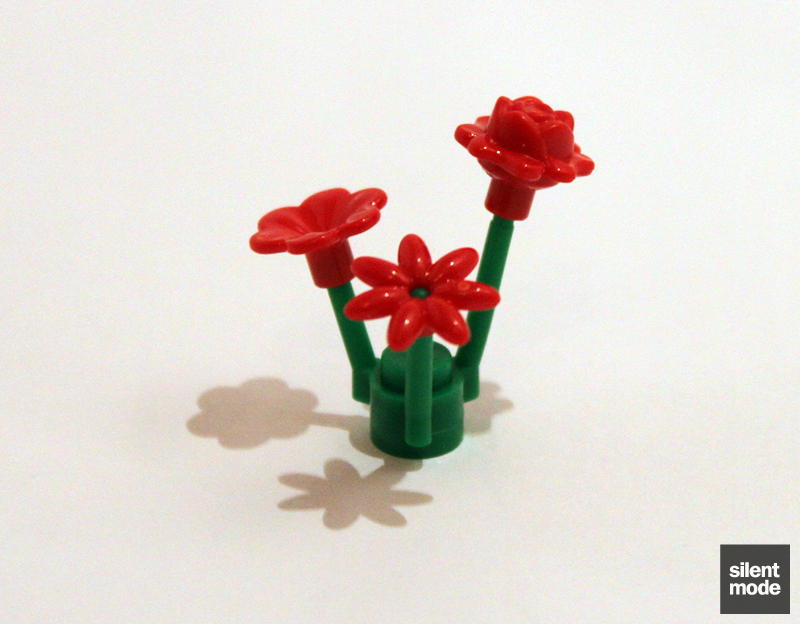 Making a welcome return to LEGO sets are flower parts in Dark Pink and Yellow… here’s hoping Blue, and colours other than Red or White, come next. We also have the usual foliage parts in Green and Bright Green. Here’s why foliage is significant. After being brave enough to pose the question at this year’s AFOLcon, I was told there were going to be new plant parts for 2012 (with the Friends theme, which at the time was unknown). 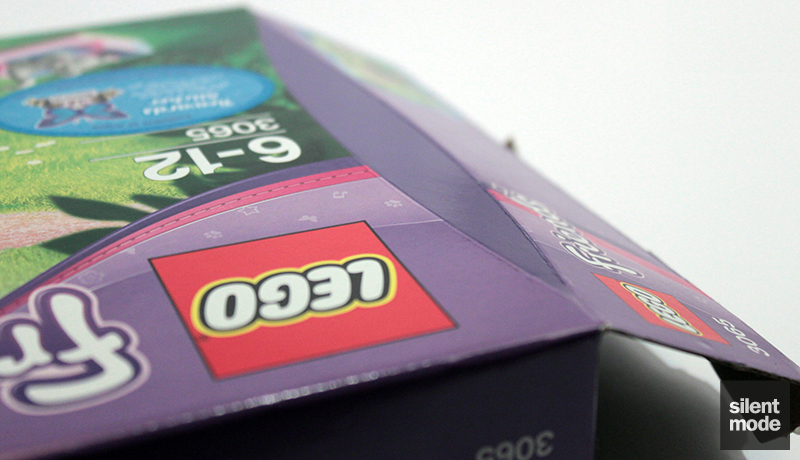 I first saw these parts on the box of set 3188, and I thought LEGO had lost their minds. Butterfly-shaped flowers?! Ladybirds?! I knew they were trying to make a girly theme, but this was taking the cake. But a closer look made more sense: we have three different flower shapes, including roses. 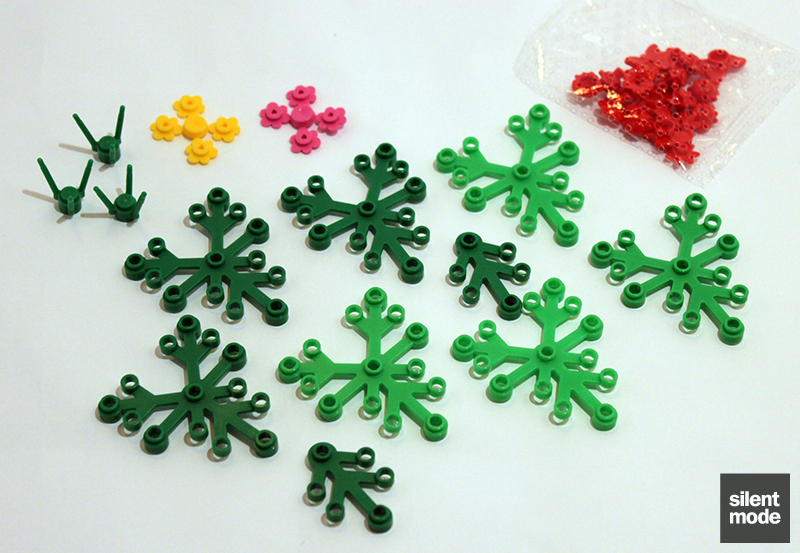 Those bugs aren’t necessarily flowers either, but extra shapes one can use to decorate their MOCs. Someone is going to find these extremely useful, and probably very expensive. 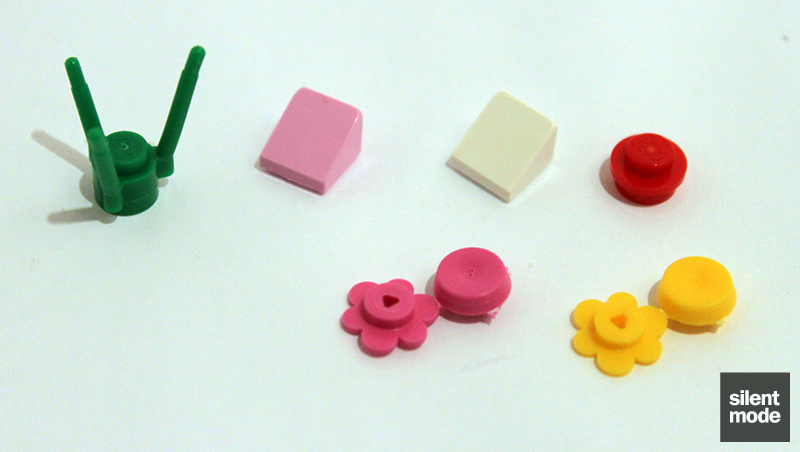 You get four of each shape in the set, for a total of 20 new flower parts. However, for some strange reason, these are all counted as one part. These new flower parts fit on plant stalks, but they’re a very tight fit. 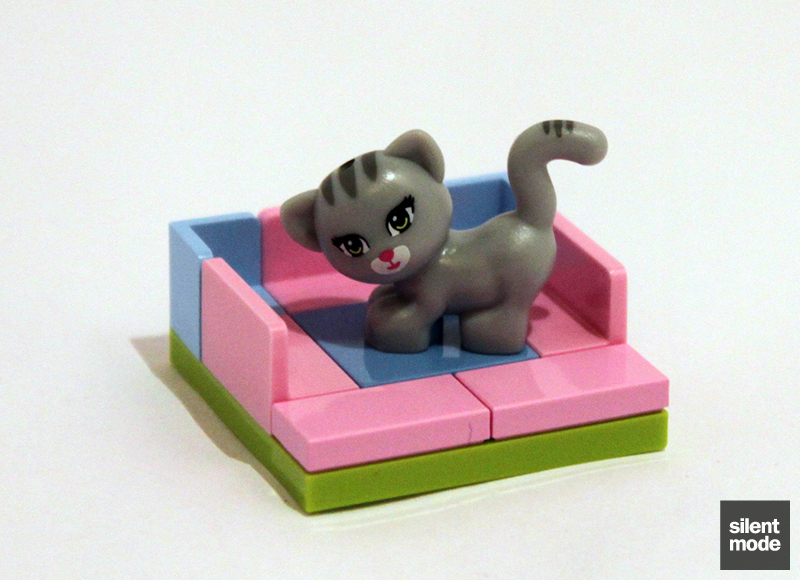 Also included in this set is a very “feminine” kitten, along with a bird that sits in a birdhouse. I didn’t even realise there was a bird in the set until taking this picture. I picked these as the most desirable parts in the set. The Medium Lavender parts and Bright Pink SNOT bricks were no contest, while at least one of those birds has to be in just about any builder’s collection. We also have 11 Medium Dark Flesh bricks to play with. Personally I don’t like this kitten: it was the primary reason why I didn’t pick this set up first. I think the old Belville cat would go better in this set, but then again maybe girls prefer kittens. 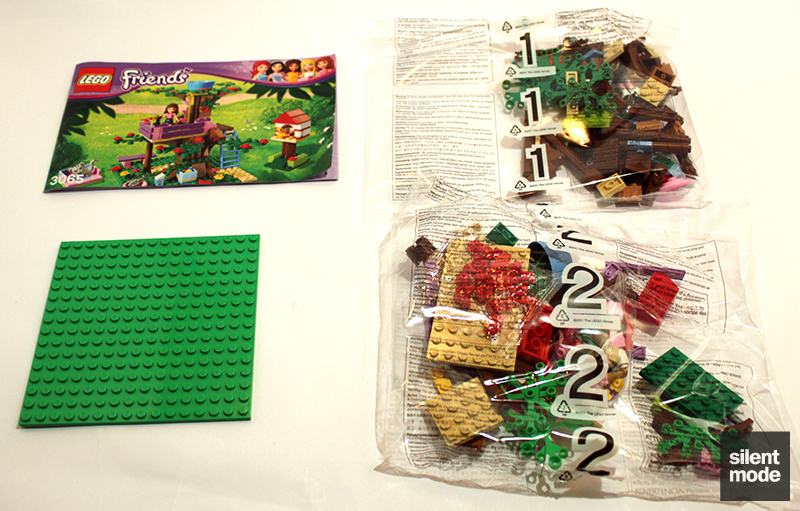 The remainder of bag #1 is for the base of the tree house, with our Bright Green plate coming into play. For some reason the base incorporates a hiding place for jewels, which is what the Bright Light Blue container is for. Is there something Olivia isn’t telling us? Maybe that this nature observatory thing is a front for something else? Bag #2 has the parts for the rest of the tree house. Seriously, they waited until now?! Well it’s not too difficult to put these bits in, but they could easily have been introduced earlier. 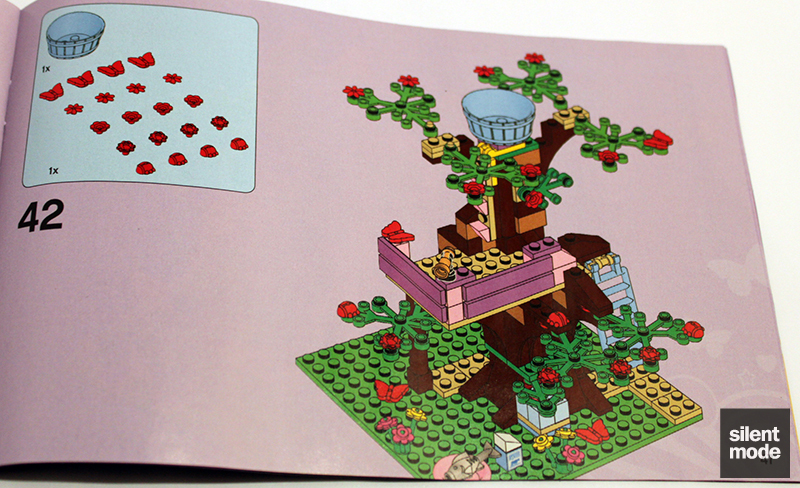 What isn’t made obvious at all on this page is that you’ll end up with one ladybird piece left, which is used with the bird house. Here’s the bird house with the tree house, and the remaining ladybird part. Olivia on another mission to save the world from the forces of not looking after animals. 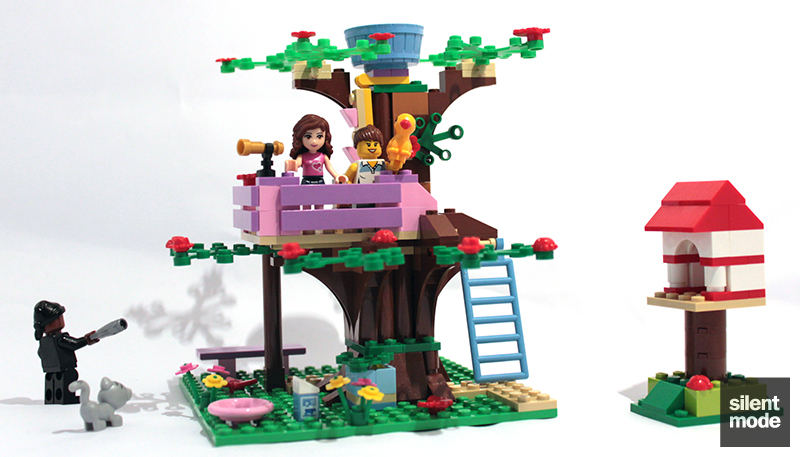 This gives an idea of how big the tree house is compared to a minifigure. 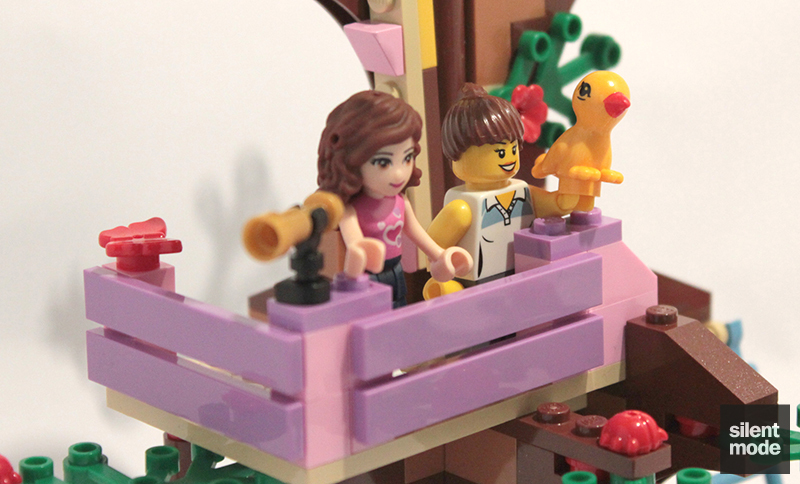 Both Friends figures and minifigures are tall enough to reach the telescope. It’s a little odd that the minifigure looks slightly older, despite being shorter. Giving the bird its new home. Minifigures aren’t that much shorter than Friends figures, and with the skirt piece they’d be just as tall, so there’s the slim possibility of coexisting. A lot less parts than I’d expected, but at least we have some cheese slopes. 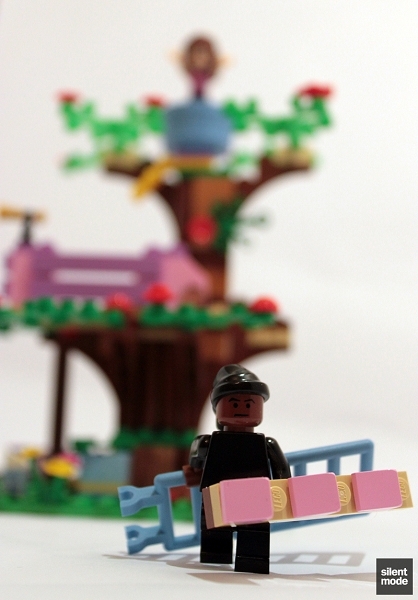 I think this is a very good start for a girls-based LEGO theme; the build itself is similar to any other set, and there are no condescending juniorised parts (like in Belville). As mentioned before, it could easily be adapted for boys, or to some other theme, just by changing the colours of the parts. 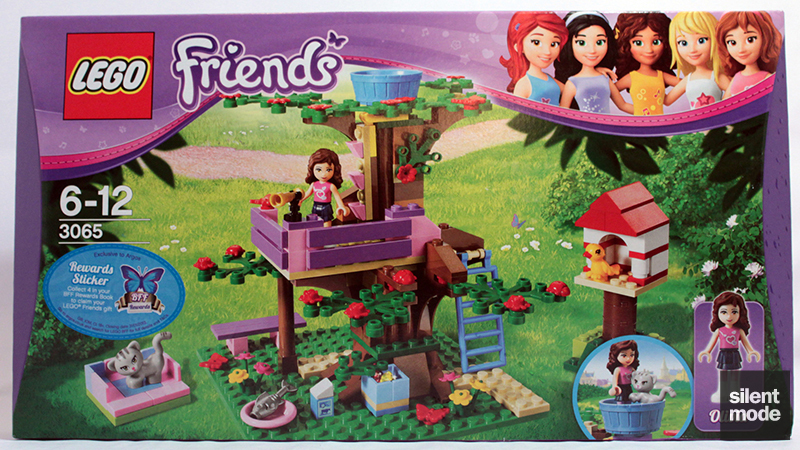 The only stand-out part is the figure, but the set’s been designed so that the treehouse could be just as much for minifigures as it is for Friends figures. The parts in this set are worth the price of entry, and there’s plenty of them to warrant getting two or more of them for parting out. Those flower parts, and most likely the bird and Medium Lavender parts, are going to be in high demand – you just wait and see. If there’s one thing I don’t like about the set, and one thing that put me off getting it in the first place, it’s that darned cat. 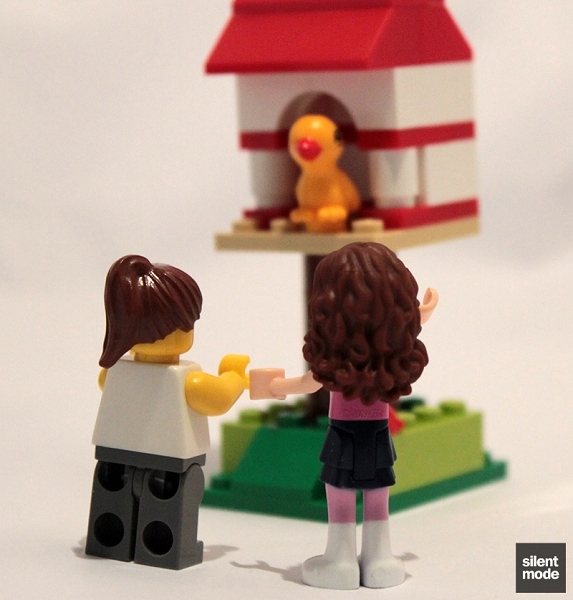 It could just as easily be replaced with a minifigure-style cat, or perhaps even the Belville cat. I don’t even think the cat basket is necessary; if they’re meant to be outdoors, I’d imagine the cat would use the opportunity to go wandering. At the same time, young girls (the target audience) might actually like it – and I suppose the cat ought to have somewhere to rest. 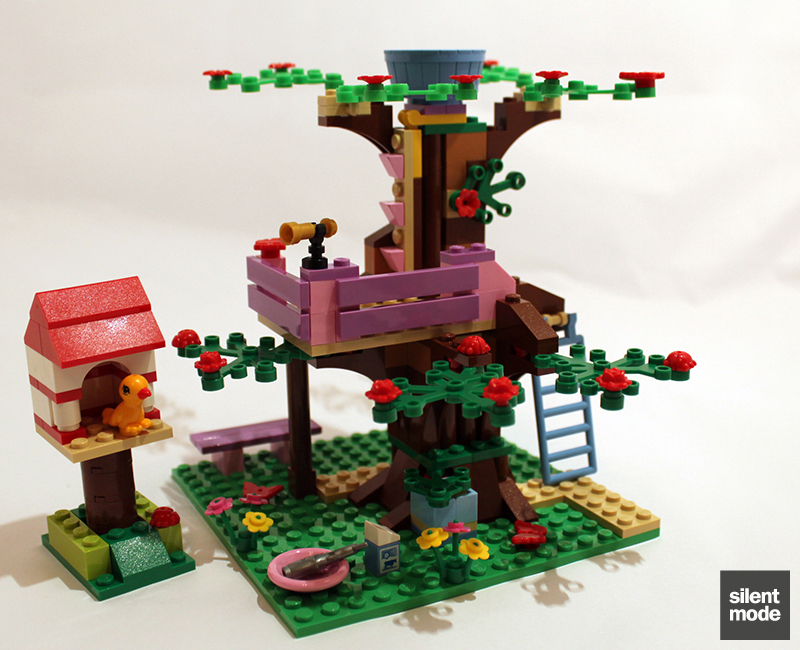 Very clever use of specific parts to create a tree-like structure, as well as the tree house itself. Colours could easily be substituted if it's not to your taste. 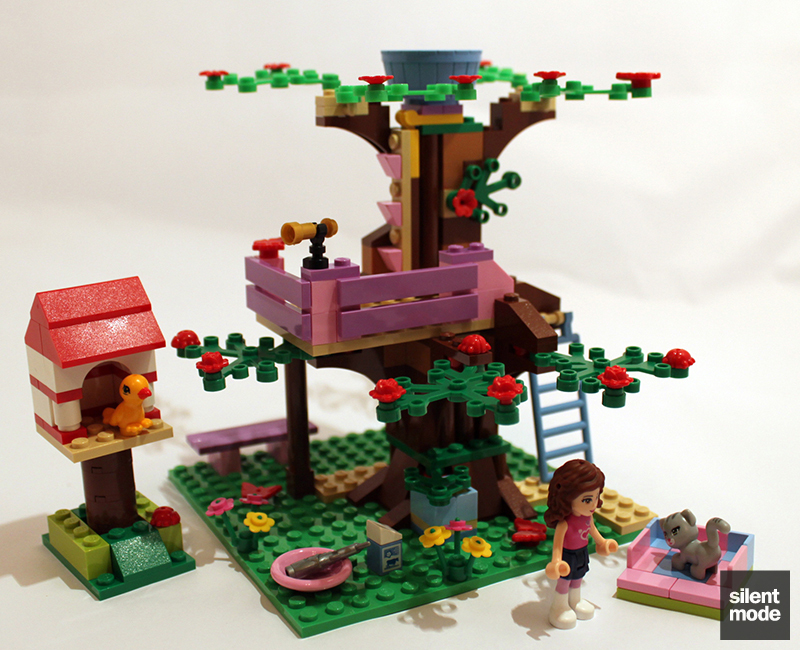 The only complication was placing 19 of the 20 new flower parts after the tree house was built; otherwise there was nothing difficult. 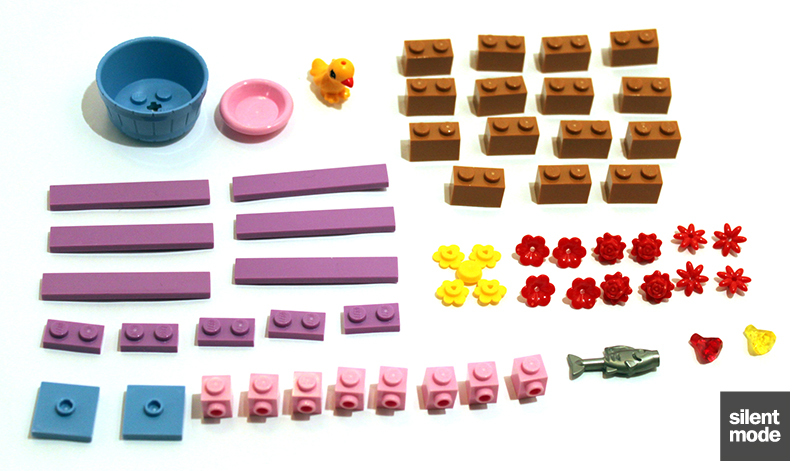 A number of very useful MOC parts, with some in new and/or unusual colours; uses outside of the set may be limited however. Simple with room to play with the set as is, or to modify and even extend the tree house into whatever you want it to be. Based on these scores the Tree House gets a solid 8.0/10.